Nearly a year ago, I did a post on nutritional yeast. I recently received a comment from an anonymous reader suggesting that I use it to make Yumm Sauce, an almond sauce invented by Café Yumm! in Eugene, Oregon. Internet research led me to numerous copycat recipes for the sauce, which is available in its authentic form from Café Yumm! The recipe I used (set out in full below) produced an excellent sauce, intensely almond and lemon-flavored and resembling tahini, which is sesame seed-based. What to do with the sauce? 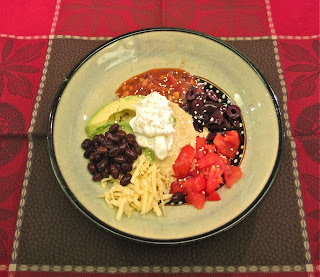 You could use it as a dip with pita chips or bread or make Yumm Bowls, a healthful, hearty dish that they make at Café. 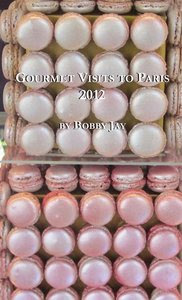 The Café's blog has a video demonstrating how a Yumm! Bowl is made: atop brown rice, add a ladleful (I used 3/8 cup) of Yumm! Sauce, then small quantities (I used 1/4 cup each) of black beans, chopped tomatoes, salsa, grated cheddar and sliced black olives, a couple of slices of avocado and a dollop of sour cream; then garnish with cilantro (I sprinkled sesame seeds). Tasty, simple, vegan and gluten free. Blend nuts, beans and oil in food processor. Then blend in yeast and liquids one at a time. Puree until smooth. 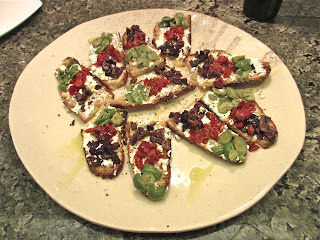 In September 2010, I did a post on sun-dried tomato and olive crostini, an hors-d'oeuvre that I developed on the fly that has become a standard at our house. It is a simple mélange of the vegetables (finely diced), ricotta, Greek yogurt and good olive oil, spread on toast.